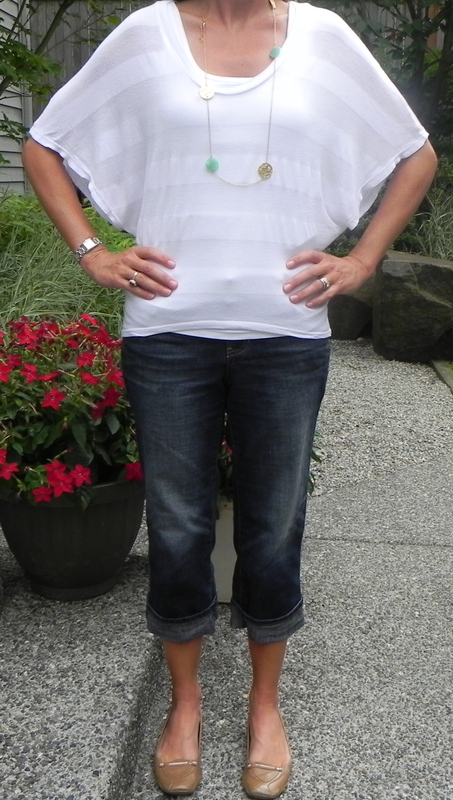 August 29th, Cropped Jeans and White T. Classic, but Boring? Cropped jeans and a white t shirt. A more interesting white t shirt make for more style, right? In my attempt to me more stylish I am learning one thing. I need help! I look around and see so many adorable outfits, and feel so plain in comparison! Having not much to go with- I stuck with a classic look of white t shirt and cropped jeans, yet I feel like it’s really boring and uninspired. To bring my outfit from boring to a bit better; I changed the plain white t shirt to a striped shirt with a lower neckline, and I added a necklace. I think the simple changes help a bit, but I do feel the need to apologize for today. I'm having writer's block with my clothing choices. I need inspiration! You look adorable in jeans and a t-shirt! What’s your workout gear, Megan? Inspired by your “shorts vs. skirts” comments, I wore my tennis skirt instead of workout shorts for my daily walk with my dog. It was so much more comfortable! Great idea! I’ll love the idea of showing cute workout wear. I’ll start WWW- Workout Wear Wednesday. Thanks for contributing. Now, send a pic of you in your cute skirt!